The magic number to clinch the 1 seed in the east is 4. Stanley Cup of Chowder is in another contest. Tim Thomas Hunts Bears is 6-0-0 with 1.32 goals-against average and two shutouts in his last six starts versus the Senators. People are pledging to Right to Play for Bruins achievements. Kessel is skating, but not back. Neither is Thornton. Thomas vs. Auld in nets. The leafs are mathematically out of the playoffs. Brian Burke is going to send an offer sheet to Krejci or Kessel this offseason, maybe. There's a new Fluto mailbag. "Good bet that the Bruins will start on Thursday, April 16. Game 2, then, would be on Saturday. Not sure whether it would be an afternoon or night game. " SENShobo says there's plenty to fight for. 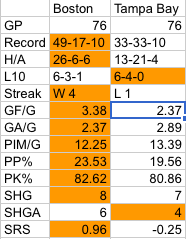 Other Sens blogs: Sens Army, Silver Seven. The two above and to the left are behind the No Habs No campaign. Cameron Frye: "I would take a loss only if Carrie Underwood was in town and for some freak reason during the t-shirt toss, she got shot in the face with a t-shirt gun. I'm not saying kill her, I'm just saying - a black eye or bump on the forehead would be amusing to me." Stanley Cup of Chowder: "The Senators have the highest winning percentage in the league when leading after the first period (.875)." Public skate today, as well. HubHockey: "I would watch the Bruins power play and traffic in front of the net tonight as tonight's keys to victory." The Bear Cave: "Manny Fernandez got the nod in the first two, making 47 saves on 53 shots for an .887 save percentage with his 2-0 record. 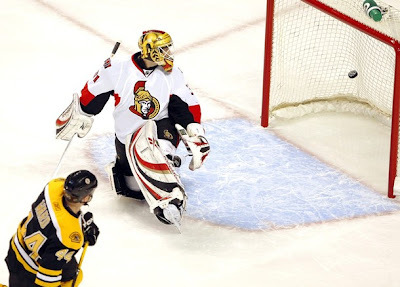 Tim Thomas has started the most recent two games, going 2-0 with an .880 save percentage after stopping 44 of 50 shots." Matt Kalman: "The Sens are going to start looking toward next season. That means rookies trying to get a headstart on training camp and veterans trying to either earn a chance to stay or impress other teams that will be shopping for free agents." NESN First Shift: "It would be very easy for the Bruins to take their foot off the peddle [sic] right now against an Ottawa team that they’ve taken six-straight decisions from and a team that has nothing to play for except pride and roster spots next season." Is there significance to the selected box? Also, it's Ottawa, not Tampa.